Aiming to help businesses and companies achieve exponential growth and success, the tech giant developed an interactive digital board for upgraded collaboration and productivity. 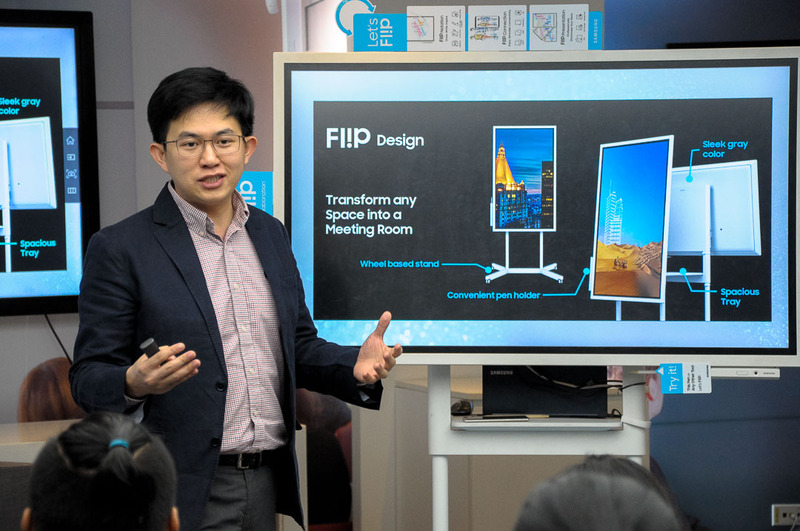 The Samsung Fl!p (Samsung Flip) replaces traditional office tools, taking elements from the paper flip chart and analog board to generate game-changing ideas. The Samsung Fl!p offers enhanced digital engagement while keeping the familiar feel of traditional writing. Its interactive and user-friendly Ultra High Definition (UHD) display helps users to fully engage in meetings and navigate ideations without having to interrupt each other. Additionally, the Samsung Fl!p ‘s portable, wheel-based stand transforms any location into a huddle room, providing users a faster and smarter work environment. Built for the way we work today, it adds flexibility for businesses with limited conference space. The Samsung Fl!p display can also be rotated to portrait or landscape orientations when coupled with pivot stands. This helps users maximize available writing space at preferred position. Meanwhile, the digital flip chart ensures all voices are heard during meetings by allowing up to four people to introduce content and annotate on the screen at the same time using their fingers or the dual-sided pen. Users can also customize his or her own writing style, size, and color, with each notation made clear and visible by viewer-friendly display. Sharing of notes is made easier, as well. The Samsung Fl!p can seamlessly connect to a laptop, smartphone, or tablet, allowing users to import and export personally-stored content on the board in a split second. Meeting participants can easily capture and download content and send them through email or a USB device, making handwritten minutes a thing of the past. On top of these, the Samsung Fl!p safeguards valuable ideas flashed on the screen through a password-based protection system. This function ensures that only approved users can access the information posted on the screen.